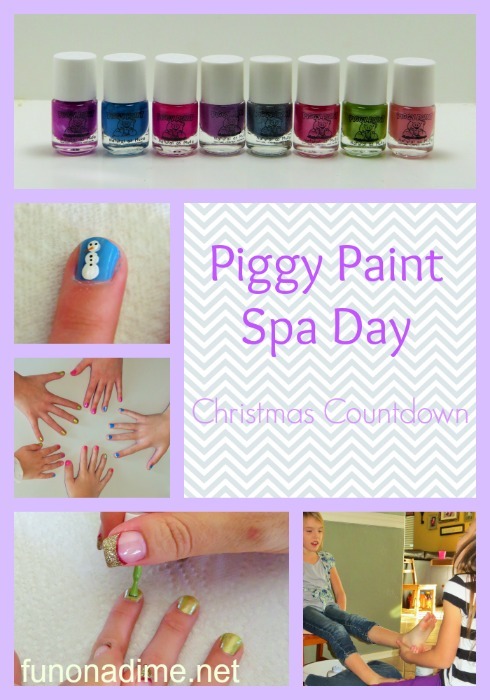 We are well on our way in our Christmas Stocking Advent and todays activities is to paint nails. We are taking it one step further and are having a spa day at home! With 6 daughters learning how to do manicures and pedicures at home is a must! Can you imagine how expensive that would be if we went to a salon. Having a salon day at home needs just a few simple things and is easy to throw together. First off you need some great nail polish! When I was shopping at Walmart last week I picked up some Piggy Paint. It was new to me and I have to say I am super impressed!! You can even get 15% off through December 23, 2014 if you use the code piggypaint at piggypaint.com. It was in the kid friendly section and at my store it came in two packs. I picked all the colors they had available and came home with 8 different ones. Lots of variety. Next we massage their hands with lotion. The girls all take turns doing this to each other. For pedicures we soak our feet in a foot spa. If you don’t have one a bucket of warm soapy water would work but these foot spas aren’t to expensive and they make it way more fun! We have a couple of them so we normally split the girls up and some start with pedicures and some start with manicures. After a nice long massaging soak a massage with lotion is next. This is my favorite part. Of course all that is left is some pretty paint. Sometimes the girls take turns doing this but today I painted everyone’s with the new Piggy Paint. I have to say I was super happy with this paint. It had no smell at all and is non-toxic which is great since I have some annoying nail biters! The colors are nice and vibrant and the girls got quite creative putting them together so they were all unique. Last but not least is the designs. You can’t have a manicure without the pretty designs. One trick I have learned from having my nails done is Acrylic Paint works great for designs. A tiny paint brush and some tooth picks is all you need to create some cute simple designs. Most of my kids were into polka dots today but my one daughter wanted a snowman for Christmas time and it turned out soooo cute! Hope you are having fun with your family as you count down to Christmas!